Had a miniature of this and the 21 year old come free with a bottle of the excellent 15. Nose. Big sherry and Kola Kubes (a british cola favoured sweet). Palate. savoury initially with surprisingly white grapes and digestive biscuits, nutty and then raisins and sherry, lots of sherry. Finish is quite short, with surprisngly a little peat. I expected this to be a one note whisky with that note being Sherry. Whilst it hits the Sherry notes big time it's actually got a bit more going on. Generally whiskies over 20 years are out of my price range. 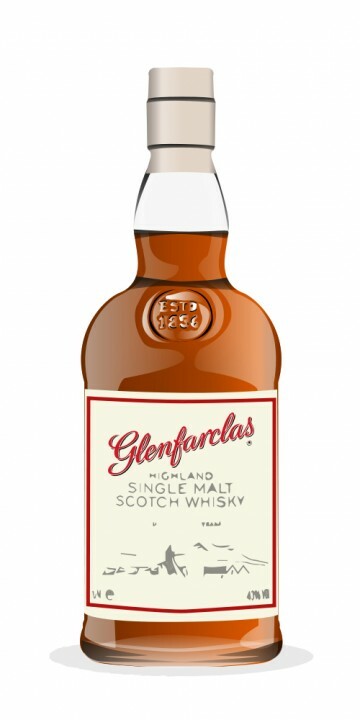 But Glenfarclas's older bottles are (relatively) reasonably priced and this whilst more than I've paid for a bottle so far I could just about afford if I didn't buy any other bottles for a month or two. So I may see if I can save up for a bottle at Christmas as a present for myself! Nice review. After a rocky start to my relationship with Glenfarclas, they are becoming one of my favourite distilleries. There’s a real brightness to their spirit that I just love. I’ll have to keep an eye out for this one. @BlueNote That Kensington bottling would have been more than I ever spent on a bottle, but it was exceptionally priced compared to other 25 YOs. Macallan 25 at 43% goes for $2000, Highland Park 25 at a higher ABV is $880. I think this one was less than the one reviewed here. Nose: Warming and smooth, yet with a sharp edge. Sultanas, Apples, Cinnamon. Treacle, Sticky Toffee Pudding, Dark Chocolate yet tempered by acidic notes. This is gorgeous and intense! Palate: Much more subtle. Very... no, extremely smooth! Chocolate and caramel flavours. Hints of vanilla ice-cream. Very slightly nutty. Mellow, almost euphoric, (am I getting carried away??). The Finish is long. Vanilla cream remains for a considerable time. Walnut Whips suddenly spring to mind. Eventually fades leaving a very delicate bitterness. Wow - I have now tried every Glenfarclas up to the 25. This was truly delicious but I cannot say if it is my absolute favourite, (the 21 at just a bit more than half the price of the 25 is excellent). What I have noticed is that every whisky-loving Scot I've met raves about Glenfarclas, and I think overall this distillery is just about the best for price/quality ratio. @Nemesis101 - thank you for a well written review. I think the 25yr and 105 to be my favourite expressions from the distillery. I have already written a few Glenfarclas reviews. Read those for the blurb and why I like the distillery. Here are the basics of this bottle. It is smoother and creamier than the 21 but I prefer the 21 personally. @rigmorole Did the store give you a refund? When this bottle is empty I wont replace it like for like. I will either save a few quid and get the 21 or spend a little more for the 30. Or, more likely, buy the 15 and then save the rest to spend on something new and interesting. Bought a bottle of this and returned it to the store. I thought it was terrible. I've tasted it at the pub and it tasted much better. I thing the bottling at the pub was quite a bit older. Nose: Light. Nectarine with a touch of almond and butter; the fruit becomes even lighter strawberry/rose. A faster inhale reveals black caffeine (either tea, coffee or bitter chocolate). Palate: Entrance of toffee and raw almond-- though a bit muted or stale (steamed white rice or the smell of coffee grounds). Some very dark cocoa becomes more apparent throughout the experience. (This cocoa gives the usual sophisticated bitterness, but the bitterness is lessened if given the chance to oxidize, developing some caramel.) Not much fruit here, but maybe thin strawberry juice if you had to point to one. Finish: Woody caramel and a sensation of having just eaten some dark chocolate, which lasts medium-long. The 25 is smooth and a bit dark. Compared to the 21, this is more cocoa and "muted" rather than peach/nut and lively. This is even more true compared to the 15, which looks like a bright flashy dancer-- vs. the casual onlooker in a dark corner. So if you're exploring the Glenfarclas range, don't expect the 25's character to be similar to either the 15 or 21. The closest Glenfarclas is the 30, as they both share these smooth/muted/dark characteristics. I describe them very similarly. The main difference is that the 30 gives more grape character, whereas the 25 gives other light fruits and more cocoa (especially in the finish). The closest other malt I can think of is the Macallan 18, which is less flat in the palate. Both have the same strong cocoa sensation, but the Macallan has more grape/wood/zest, whereas the Glenfarclas may have more cream/nut. Both are excellent for this shade. In the UK the 30 year old is an absolute steal....You can get them for around 130 quid these days.... I'm stocking up on all the Glenfarclas I can get.... it's one of the few remaining whisky-bargains still left. N: sherry, sophisticated array of sugars and the malt. The sense strain to assign metaphors and similes. P: A bombastic yet sophisticated barrage of caramel, oak, vanilla, mint. The palate changes in a chimerical way, unfolding, teasing, growing, fading, changing, fading. F: Extremely long, complex, delicious, and with a zest that stings the tongue perfects and with a tartness that is quite pleasing, which then fades to a rich sweet butteriness with hints of chocolate. Yes, this Farc is downright amazing, but I might like the 21 more. Call it oddly compelling in a malty zen-like way. I have not tasted them side by side so I can't say for sure, but my memories from last winter of the 21 are hauntingly compelling. It just seemed more metaphysically "deep" whereas the 25 was moving in the direction of sherry intensity in a more commonly "scotchy" way. This said, it was much more "grown up" way than Aberlour A'bunadh, for instance, which is understandable because of the age difference. The 21 still has my allegiance, and I can't quite explain why. The 25 is upfront in its designs on your senses. I might almost say "uncomplicated" in a very good way. It is not a perplexingly complex dram, but it is supremely satisfying and chimerical. One thing I like very much about the Farc 25 is that it is nothing like a bourbon and yet extremely sweet without being cloying. A damn good dram. I added no water, nor did I want any. Outstanding stuff! You truly are a master at this craft! Thank you for your words. Brilliant review - makes me want to go out and get one! Glenfarclas just pumps out whisky. My notes on Glenfarclas all come from a tasting where we got the 105, 15, 21, 25, 30 and 40 expressions. The great thing about Farclas is you can taste the breeding, this is the older brother of the 15. Bloddy good stuff. Nose: viscous, heavier more muscular nose, plenty of tobacco, orange marmalade, leather and a really nice muscovado/burnt sugar character, this being glenfarclas, of course there is sherry. Pallet: this tastes like the 15 year old’s older brother, again juicy and ripe fruit on the palate, old wood, leather and tobacco (to be expected), nice balance between sweet and savoury, not so much burnt sugar here. Finish: rum and raisin, with some good almost flavours too. The mark is 89, so for me it's not a great whisky, i can't give you a definitive reason as to why not but somehow its exceptionally good. But just not great. Nose: Sweet and salty. The sweetness is a bit non-descript, but seems to hover between rum and typical oxidative sherried whisky. The salt is part soy and part stale red wine, but in a good way, strangely. A bit of coffee cake with a thin layer of strawberry preserves on top. Palate: Not watery, but a bit cool and quiet. Really just showing a bit of fruit, strawberries, lingonberries, and maybe Gran Marnier for a hint of chocolate liqueur with a trace of bitter orange extract. Not terribly complicated or dense, and a rather light and straightforward sherry. Nose: thick on the sherry, buttered grains, roasted almonds, orange rind, possibly some black tea, vinilla sweetness. Palate: Heavy on the sherry, creamy and buttery feel, dark caramels, black forest fruit cake toped with roasted almond nuts, a smooth and tangy note, smooth creamy expresso and dark chocolate taste. Finish: Quite long, transitions from fruit cake to leaving a buttery cocoa / creamy expresso taste in your mouth. Similar to the 15yo, has a similar palate but a much preferred finish (this buttery chocolate feel), slightly more complex but costs significantly more. Unfortunately the nicer finish and added complexity don't really justify the higher price. I'd recommend sticking with the 15yo unless your a Glenfarclas fan with cash to spare. I ordered a gift box of Glenfarclas 15yr in January, and this wee bottle of 25yr came with it. I think it is now time to crack it open and enjoy! Palate: Ooh! A little tart. Spices building. The mouth leaves a lot to be desired. Not very good, really. Finish: THERE IT IS! Long and wonderful. Not very sweet at all; mostly spicy and cinnamon. The backwash of aroma is fantastic. Just a subdued version of the nose. More spice; less sweet. I come back to the nose for the best part. It is intense, flavorful, and mind-numbing. Pralines. So good. This whisky has a great nose, but the 15yr beats it -- hands down. Gave this 25 year old a go after I heard some amazing stuff about it. Did not get disappointed! On the nose it is delivers some amazing caramelized apples, some sherry. You could nose it forever! The taste just flows through your mouth with cheer joy, smoothness is the key word here. Chocolate and caramel again. Finishing with a medium long sweetness. Just a blizz when you want the simple enjoyment of a good, not overwhelming whisky. This is the second of two taster bottles that came with my purchase of the Glenfarclas 15 year old, so I thought I would give it a go. The nose is certainly powerful, I can sit it on the table in front of me more than a yard away and within a minute I will start getting tantalising wafts! But for all it's strength, it's not overwhelming at all. Really complex, full of nuts, honey, citrus, sherry smoke, a hint of fruitcake overlying a constant note of peat. Superbly balanced. So good I am hesitant to taste it as it can't possibly taste as good as it smells! After several sniffs, and more than a few moments of hesitation, the taste is robust, coming in a big wave, but not overwhelming, just huge! There is a bit of a battle between the sherry smoke (and thanks go to @BonnieMac for that term - it hits the nail on the head for this particular taste) and an oaky nuttiness going on that is riveting! Over a few sips, as you become used to the back and forth, a beautiful rich dark chocolate taste at the back of your tongue becomes apparent, along with some subtle hints of xmas cake. The finish is big and warm, full of sherry smoke, oak and dark chocolate; it rolls through in a huge gentle wave. As it fades a buttery nuttiness and a lovely hint of malt slowly make themselves known. Really long, ten minutes between sips and it is still warming the back of my throat. This is sherry whisky nobility, right here! And I would recommend it to anyone! Powerful enough for those who aren't into the subtle stuff. Complex enough for those who do like subtlety, and although lightly peated, it's not so peaty or smoky as to overwhelm newcomers. One of the very few drams in this price range (AU$200+, £80+) that I believe is worth every penny! It's now in my top half-dozen favourites, and I will be buying a bottle! And I got my taster free with the Glenfarclas 15 year old - this is how marketing should be done! My daughter, God bless her, bought me the 25 year old Glen Farclas for my retirement. I must say that while it is heady, as indicated in the review above, the taste experience is plethoric in nature. From the first tasting I was presented with a symphony of flavors, but as promised, it settles down to that singular satisfying chocolate finish. Recommend highly! Tis indeed a grand old whisky.